It’s that time of the year again – my 28th consecutive Derby summer beer festival. Thursday afternoon is suitably chilled for my tastes; no crowds (but still quite busy with folk), no crush, no hassle. 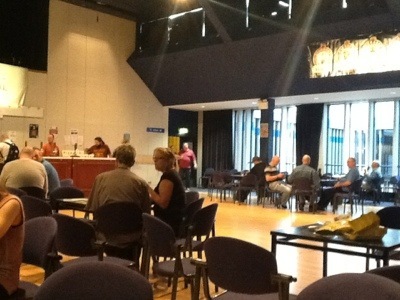 Even so, I’ve already witnessed the depressing modern face of Camra beer festivals in “action”: The Orange Shirts. This is a phenomenon which first manifested itself last year and, I gather, is now national Camra policy. A group of licenced “bouncers” patrol the beer festival to keep order, dressed in various shades of the titular garment. As an aside, in 28 years I have never seen anything approaching a fight here, but I guess times change. These guys and girls are clearly not local, being shipped in from somewhere by Camra. I mean it in the most positive way when I say that in every way they are typical Camra people. I ensconced myself in a quiet corner of the Assembly Rooms to enjoy my second half (Big Lamp Bitter 3.9%, if you’re interested, the first being Hexhamshire Shire Bitter at 3.8%) and to read Private Eye. A short but discrete distance away, the guy who runs the sound desk for the bands (and who has being doing so here and at the Flower Pot for as long as I can remember) was also taking advantage of the quiet spell. In front of him is a mug of tea or coffee and he has his feet up, taking a bit of a nap. This, apparently, is against the Orange Shirt rules. One of them wandered by and proceeded to wake him up, telling him it’s against the law to sleep in public (eh?). Duly woken, sound guy replied that he works here which seemed to satisfy the Orange Shirt who then wandered off in my direction. I took it upon myself to explain who the the guy is and that he would be busily working until midnight – no wonder he was having 40 winks. The Orange Shirt replied that he looked drunk (though admitted he wasn’t) and that it would encourage more people to get drunk. Not sure how he expects to enforce his Don’t Get Drunk at a Beer Festival rule? Unlike the Orange Shirts, I contend that being drunk isn’t a binary state. Offensive/violent/incapable drunk is obviously out of order, but merry (sleepy?) drunk is surely part of the beer festival experience? Meanwhile, a young girl with a clipboard has wandered by, inviting all and sundry to “sign the e-petiton”. Evidently this is one of Camra’s campaigns and they see the captive audience of a beer festival as a way of boosting support for whichever cause it may be. I politely declined and the girl moved on to an old boy seated a little way away. He cheerfully said yes and proceeded to sign – without asking or otherwise having explained what the particular cause was. To my mind that kind of undermines the worth of the petition – they may as well simply reproduce the membership list and call that a petition? The aforementioned old boy soon got up and left, but not without asking me where I got the Wallace & Gromit T shirt I was wearing – apparently his grandchildren would love it. As it’s probably 15 – 20 years old, I haven’t a clue! He then showed me his Wallace & Gromit sound clip app in his iPhone (he didn’t look like an average iPhone user!) which his grandchildren “made” him put on it. Only at a beer festival. After a relatively exciting first half an hour or so, things have settled into a more routine pattern. The crowd is slowly swelling as the Main Hall has reopened (closed during the afternoon “to preserve the quality of the beer”?). Highlight of the People Watching thus far is a group of Japanese (?) lads, about six of them, who are sampling the best of what British culture has to offer. 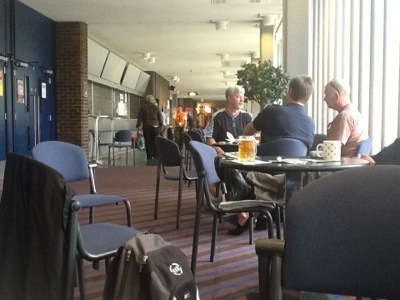 More power to them as they’re evidently having a go at all sorts of real ales and look to be enjoying the experience. I’m tempted to go and ask them what they make of it all, but I doubt “coherent” would be the best description of the ensuing conversation. The choice of beers is up to Derby Camra’s usual high standards, with some notable new appearances. Townes of Chesterfield are represented by their Stavely Cross (4.3%) and despite their relative proximity to Derby, I’m pretty sure I’ve not seen them here before. Even more notable is the appearance of three beers from the Isle of Purbeck brewery, all the way from the Bankes Arms at Studland. As Kay said when I texted that snippet to her, “it’s a sign”. (We’ve stopped there a number of times on our semi-regular short break to Dorset). I’ve now been asked three times to sign the e-petition. Apparently Camra want to prompt a Parliamentary debate about escalating tax on beer. Fair enough, but maybe drinkers should pay a proportionately higher contribution to the NHS to subsidise potential long term health issues than the general tax paying populace? Not sure I’ll express that view outwardly, however. My point is that even though this is a Camra event and they are, as the first three letters in their title subtly indicates, a campaigning organisation, it is becoming something of an imposition. Again, I fear the general point of a beer festival may be being missed somewhat? Bumped into Martin R (ex dog man for those who know him) and had a chat. He’s one of the cellar team for the festival, so the beer is in good hands. Apparently they had a bit of a blip last night,about which there’ll be recriminations, but no one went home thirsty and no one had a bad pint – what more could you ask of a cellar man? A very pleasant, if deliberately light, session. I’ll be back tomorrow to try more of the heavier beers. Today was about chilling and “me time” which I thoroughly enjoyed. It was exactly what a well run beer festival should be. Checked in with Rog & Marie by text to see if they were coming tomorrow. Turns out they’re in a castle in Devon celebrating their tenth wedding anniversary. OK, it’s an excuse for missing the Derby Beer Festival 🙂 Congrats. Stuck with my plan for the evening to get the 20:10 V3 home; first time I’ve used this service for a long time, for reasons I can’t adequately explain. If I’m getting off the bus outside the Green Man, it woud be rude not to go in? So I’d texted Chappers and a convivial evening ensued. 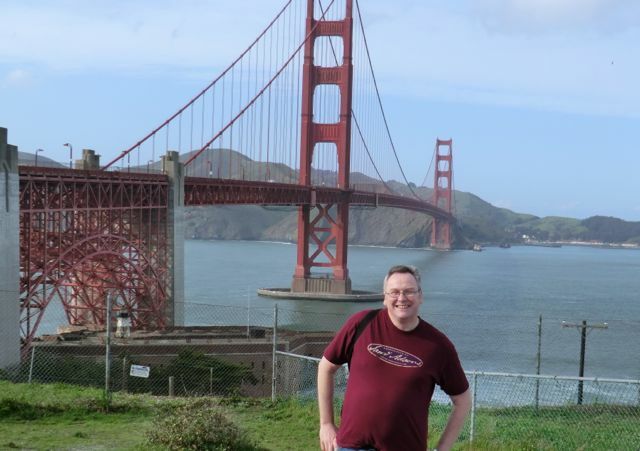 Golden Gate ... Done That! Probably of interest only to me and to my fellow tech geeks, the year opened with the purchase of a new camera – a Casio H20G – distinguishable from its predecessor pretty much only by the inclusion of a GPS chip. 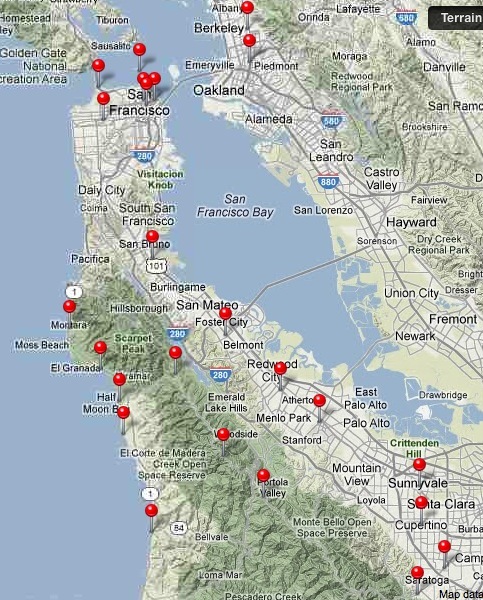 To me it has been a wonder of the modern world that photographs can have location data embedded in them, and that iPhoto allows them to be displayed on a map. So to have the camera do this automatically (And accurately) is a great advance. This really came into its own in March, as I will mention in a bit. January also brought a less welcome event in the form of an injury at work which put a big dent in my previously barely blemished sickness record. Still, going out and testing the new camera was good physiotherapy. The first trip away of the year was a weekend to Gloucester and Cheltenham in March. Not very exotic or adventurous, but we enjoyed our stay in what was then Ramada Jarvis’s Bowden Hall. 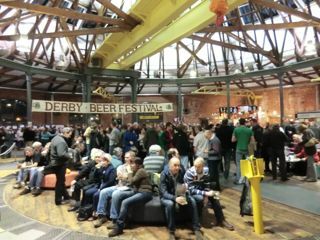 Also in February was the inaugural Derby Winter Beer Festival in the newly restored Roundhouse – a superbly atmospheric venue, but the news that an extra Gents toilet is to be in use of the 2012 event is welcome! Requiring users of the only gents toilets at a beer festival to use the main entrance/exit to the venue is a recipe for a large backlog of people. Fine ales were drunk nevertheless. The rest of winter 2011 passed uneventfully, but as March dawned, the highlight of the year arrived. Regular readers of arewethereyet.org.uk will recall the details of our fabulous trip to San Francisco and Half Moon Bay, California. San Francisco is a city rich with interesting things to see and do, and we were generally pretty fortunate with the weather. As fascinating as Alcatraz is to visit, I doubt we’d have enjoyed it quite so much without the bright sunshine which accompanied us. Certainly, when the rain came a few days later, it limited the enjoyment of the area a little, but our digs, the Argonaut Hotel, were first class and Kimpton Hotels are a chain to look out for. Once we got mobile with a hire care, however, and began to explore the area outside the city, things – literally – brightened up again. Half Moon Bay on the Pacific coast is a real delight, and to see the sun set over the Pacific surf is a life-long memory. Again, we struck lucky with our choice of place to stay, not least as we started the day with no real clue where we would end up, so it was real ‘pot luck’. All too soon it was time to fly home, though as a last surprise of the holiday for Kay, we came back in Premium Economy, the extra leg room making it almost – but not quite – a comfortable journey home. After such a high, life back home was ordinary. 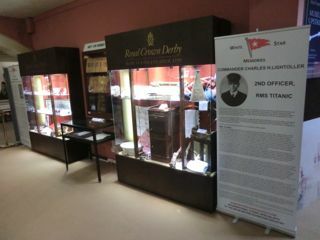 We had visit to Royal Crown Derby to see the exhibition of Titanic ephemera. To fair, it was slightly miscast, though had they billed it more accurately as an exhibition of White Star Line material, it wouldn’t have had the same draw. For my part, having lived in or around Derby for 30 years, it was my first visit to the Crown Derby museum, which is actually well worth visit in its own right.As summer approached we had several day trips out into the Peak District to appreciate the beauty on our door step. I took a drive over to the Potteries to successfully seek out the grave of my great-grand parents in Tunstall Cemetery in order to keep my genealogy quest going. 11th May was a highlight – the arrival, at long last, of my iPad2. Though still hard to get, several weeks after their UK launch (they were released when we were in San Francisco, so I’d had a play around with one then), I managed to secure one on-line from John Lewis and hotfooted it over to Nottingham to pick it up. The device has barely left my side ever since, though I admit that this is being typed on my MacBook. As good as the iPad virtual keyboard may be, it still doesn’t lend itself to long, illustrated, blogs. Also in May, one of several beer drinking highlights in the year – Rail Ale at Barrow Hill. Inevitably it rained (the event wouldn’t be the same without a drizzle finding its way through the engine shed roof!) The vent continued the theme of drinking beer in Midland Railway buildings, which is always fun, and there was – as you’d expect – another fine range of beers to go at. With June came a domestic upheaval as the incredibly long overdue replacement of my bathroom began. 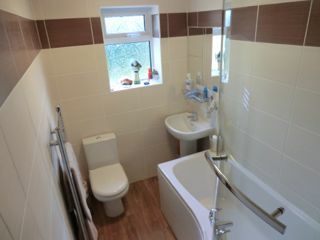 Having lived with the 1970’s burgundy bath and suite, it was definitely past its end of life by the time work started. Not wanting to be in a house for too long without toilet facilities, I upped and went off on my travels. Kay was on holiday with her mother in Spain during this period, so I headed for Dorset. The first night of my adventure was actually in Birmingham as I went to a concert at the NEC. Originally booked when we thought Kay could go too, I ended up enjoying Journey, Foreigner and Styx all by myself (and a few thousand other crowd members!). I arrived in Dorset to find it sunny and beautiful as ever. I stopped in the Grand Hotel at Swanage, having secured a good rate on line of course. 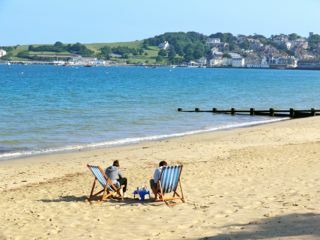 Though I remember having meals there when Mum lived in Swanage, this was the first time I’d stopped there. Though perhaps living on time os long gone grandeur, it was nevertheless a pleasant hotel to stay at. I’m not sure if it was the sun (yes, it was that strong) or something I ate, but my last night in Dorset was marred by being slightly under the weather – so much so I didn’t even go out in search of beer from the several excellent pubs in the town (or the hotel bar which served real ale). On my return from Dorset, Kay was still away and my bathroom was nearly complete. At least it was usable. When the finishing touches were applied, I was delighted with the end result and would heartily recommend Colin Hitchcock, the plumber responsible, for any other work. Work-wise June was notable for a week’s driving refresher, which was a fun break from routine. Though with a true lack of foresight other part of the job, I would be at the retirement do of my cremate on the course before the year was out! The summer Derby Beer Festival in July was another opportunity to catch up with some friends I hadn’t seen all year, and my attendance maintained a tradition unbroken since 1983. A minor ambition was achieved in August, quite by chance as it turned out. Rather like the comment I made above about Crown Derby, in my years living in & around the city, I had never been up the cathedral tower to appreciate the views. As we happened to be passing by one day, it turned out to be one of the infrequent open days, so I rushed back to the car for my camera and went up. Though not the sunniest of days, the weather was fine and the views more than satisfactory. 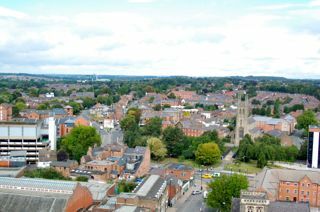 Derby lies in the Derwent Valley, so the view to the south is longest, but even looking down on the city itself presented a unique perspective. September saw the retirement do of Alan Smith that I alluded to above. Held in the Dolphin at Derby, that was a splendid night with several faces from the past showing up and many memories being recounted. The end of September, as you may recall, was exceptionally hot and warm – an Indian Summer if you will. At the risk of a theme developing in this narrative, I took advantage of that wonderful wether to visit a beer festival – this time at Ripley. So yet again I found myself drinking beer in Midland Railway surroundings as Butterley was the unusual, and very effective, venue for the event. September also saw the debut of this Blog to an unsuspecting and ill prepared world. Theoretically at least, here I ought to end this recap of the year and everything from hereon should be Blogged. True to my promise not to treat the blog as a diary, however, there should be a fair bit that happened in the later half of 2011 which wasn’t mentioned here. Autumn eventually came and 14th October found me queueing up outside an O2 shop after a night shift to buy the iPhone 4S. That, of course, was Blogged about so ’nuff said. Toward the end of October there was another concert, this time with Kay, as well as Nick & Sue. The venue was the Ice Arena in Nottingham and the act was Steve Steinman’s Vampire’s Rock. Apart from a not-so-brief technical hiccup with the sound system, the performance was very good and really entertaining…. 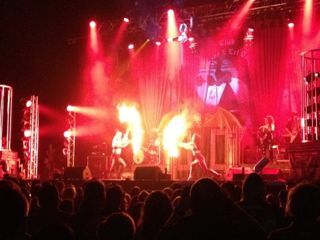 not bad for a Meat Loaf tribute! Into November and a weekend away at Center Parcs. Most enjoyable and probably should have been subject of a blog in itself. In the end, despite taking lots of photos, I didn’t get round to writing about it all. The break coincided with Guy Fawkes, so we were treated to a fireworks display over the lake – an excuse to snap lots of photos, and some of them actually came out alright. Center Parcs is notable for several things; its “sub tropical paradise”, sports activities and squirrels. 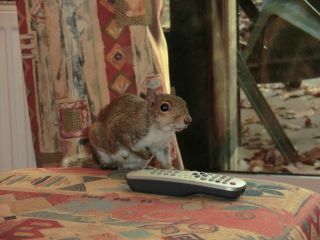 True to form, we were adopted to a number of them, and despite their reputation as ‘tree rats’ I have to say they’re quite entertaining creatures. So much so that a calendar made up of photos I took of squirrels formed one of Kay’s christmas presents this year! The other advantage of Center Parcs is that there’s not one, but two Starbucks in the village. That was attraction enough as far as I was concerned. An ideal place to chill-out. We certainly came back rested and ready to face the onslaught of Christmas! 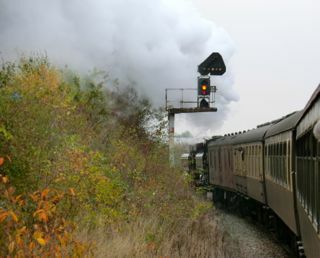 November culminated with an unusual but very pleasant day out – a steam hauled rail tour. The objective from my point of view (apart from drinking beer with good friends) was that the route of the tour was over several freight only lines in the Burton & Derby area, an unusual opportunity to see the rail network from a different perspective. The tour was very popular with 12 carriages sold out. I’m not a steam aficionado, but even I could appreciate the spectacle of two small pannier tanks slogging their guts out to haul such a long train. The refreshment break at Leicester allowed us to adjourn to the Ale Wagon for several pints and convivial conversation. Final highlight of the year was another concert, again at the Ice Arena but this time just me and Kay. The concert was opened by a joke of a heavy metal band called Steel Panther (at least I think they were a joke), followed by an incredibly loud and entertaining Mötley Crüe (the drum solo with Tommy Lee and his kit being rotated upside down while he drummed will live with me for a long time) and rounded off by Def Leppard. Though we were toward the back of the arena, we were pretty much central to the stage and so treated to a spectacular view of the stage. At its height (the drum solo) there must have been a thousand camera in the air capturing the performance – but that didn’t stop a steward near us remonstrating with someone for using their camera. Jobsworth!